This has got to be one of my favourite creations in the past couple of years. If you can’t find pomegranate molasses, try paste. It’s usually the same. Enjoy! Toss the squash cubes with the oil a salt to coat evenly. Spread on a sheet pan and place in the oven for thirty minutes, turning a time or two. Bake the pumpkin seeds on a separate pan for the last five minutes of the squash’s cooking time. Spread the yogurt across the bottom of the serving vessel. Add the squash. 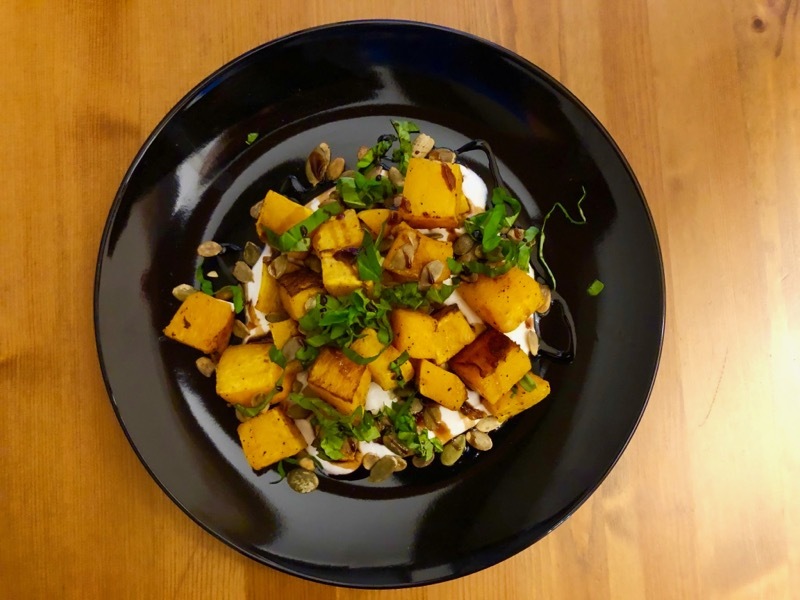 Top with the pumpkin seeds and basil, then drizzle with the pomegranate syrup.